Although tailoring is my primary passion, I’ve always worn clothing that these days would be grouped under the term ‘workwear’ on the weekend. Good denim, obviously, but also sweatshirts, waxed boots and canvas trousers. 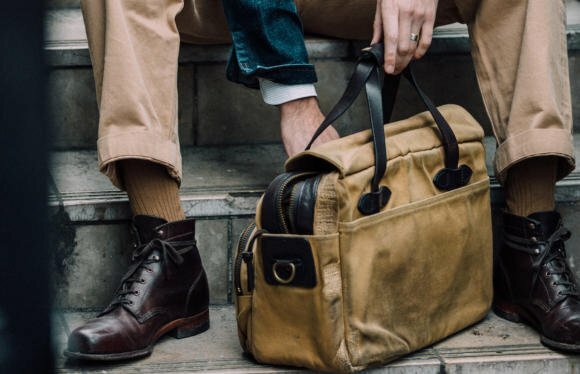 Some of the best-loved have been a pair of Wolverine 1000-Mile boots in Chromexcel leather, a battered Filson briefcase, and The Armoury’s Army chinos. 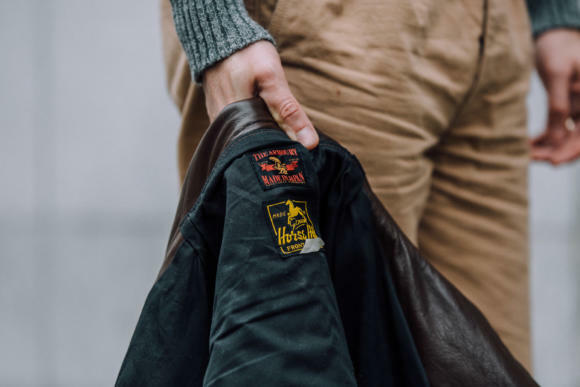 For me they’re a way to wear high-quality clothing but with a more practical, rugged feel – something stylistically removed from bespoke tailoring, but with other aspects in common. I had the opportunity to write about this recently for How to Spend It, the luxury supplement to the Financial Times here in the UK. You can read the article here. 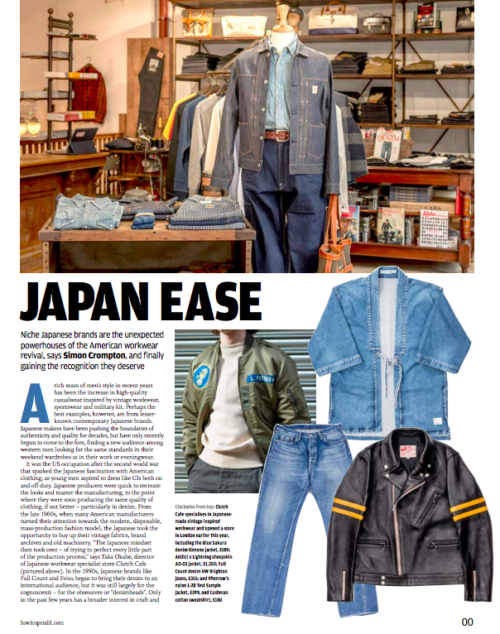 The piece focused on the rising popularity of high-end Japanese workwear; but while the Japanese probably lead the way, there has also been growth in popularity of American brands like Filson or Red Wing, and the occasional local brand around Europe as well. It’s an area I’d recommend to any readers. Although workwear is never going to take up much space on Permanent Style, I do believe that to be well-dressed you need to be able to wear knitwear and jeans just as well as a shirt and tie. Workwear rarely involves the same mastery of a skill, or investment of time as bespoke. But there are many other common themes, among them investing in quality, seeking timeless style, and supporting traditional manufacturing. I've included some examples of my favourite pieces here by way of illustration. One is the Wolverine boots above, which I bought at Leffot around seven years ago and have done great service since. The waxed leather makes them very weather-resistant (despite having a single leather sole with a regular welt), and they’re really comfortable. The only downside to Chromexcel is that the wax clings ferociously to dirt, and the vamp gets big, broad creases. Keeping them looking smart at all is not easy. I’ve written consistently about leather outerwear over the years, including recently how vintage pieces are repaired at Cromford. One of my all-time favourite items of clothing is a vintage horsehide jacket, which has a beautiful repair-patchwork lining. It’s something that will feature in the ‘How Great Things Age’ series at some point. Earlier this year I also got an asymmetric horsehide jacket that The Armoury made with The Real McCoy’s (above). I've loved how that has moulded to me, and I'll do a full article at some point. My Filson briefcase is a large twill model – bought second-hand with extensive repairs, but subsequently also hauled all over the world. It’s very practical, and a good accompaniment to other casual clothing (it's shown above with the Wolverines). Jeans of course I’ve covered consistently too. From Levi’s bespoke (above) and more recently from Blackhorse Lane. I don't think I've ever talked about The Armoury’s 'Army' chino though, which is the only chino I’ve ever had that wears in like denim. My pair are also in that shot above with the Filson and Wolverines. The Army model hasn’t been available for a while, but I’m told The Armoury are working on a new version. Loopwheeled sweatshirts are wonderful, and the ones I wear most are from Merz B Schwanen (above). But I also have models from Loopwheeler in Japan (pictured bottom) and The Real McCoy’s here in London. Real McCoy’s T-shirts are lovely and thick, but they are rather square, having no side seams. I recently got hold of a Flat Head one that is better - via Rivet & Hide - as it is circular knitted but then cut and tapered, before being re-sewn. For anyone that's interested in this type of clothing, several shops in London are mentioned in the article. They include Son of a Stag, The Real McCoy’s, Nigel Cabourn, Rivet & Hide and the recently opened Clutch Café. They’re in three clear groups, in Shoreditch, in Covent Garden and near me in Fitzrovia, so easily visited in batches. My last thought on the topic would be that I find it’s easiest – certainly at the start – to concentrate on one genre of casualwear. Horsehide jackets go great with raw chinos, cotton sweatshirts and canvas trainers. Common Projects-style trainers are better with slim, washed chinos and buttoned suede jackets. Nothing wrong with mixing them up in time, but I think casual wear should not just look relaxed, but be casual and easy to throw on as well. More on that here. And whatever you wear, it's all better than athleisure. Photography: Jamie Ferguson, for Plaza Uomo, Levi's and The Workers Club; except Merz B Schwanen shot, James Holborow. You can follow the discussion on The appeal of workwear, and my favourite pieces by entering your email address in the box below. You will then receive an email every time a new comment is added. These will also contain a link to a page where you can stop the alerts, and remove all of your related data from the site. I have been thinking about buying tougher boots that are in between Lundhags/Meindl Gore Tex on one hand and handmade chelsea/chukka boots on the other. I am thinking about Wolverines but also Red Wings or maybe Indy Boots from Alden. Do you have any recommendation. I am also curious to the pros of cons of chromexel vs cordovan. I would probably have dainite, commando or ridgeway soles (or something like that). It’s quite a broad area, so it depends which of those two extremes you want to be closest to. Wolverines, Red Wings or Indy Boots are all great, but because of their last shape and style details (eg natural welt, big round last, sometimes storm welt) I wouldn’t ever wear with smarter trousers like flannels or slim chinos. Perhaps nicer would be something like an Edward Green Galway, in a grained leather or cordovan, with a thick rubber sole. Just as tough as some of the more casual optons, but good with both denim and flannel? As a tangent to this, I’m wondering what are the best leathers for footwear when resistance to inclement weather (heavy rain, slush/snow, the former mixed with salt) is a premium? Cordovan and chromexel have been raised here. Are there others to consider? And do you have insight into which is most weather-resistant? Good question. I’ve never anaysed it in detail. Anyone please chip in if you have information there. My experience is that among smarter boots, cordovan is the best, followed by grained leathers, with storm welts making a difference but not as much as the leather (or indeed the sole). Waxed or oiled leathers like chromexel are more resistant but a different category in terms of smartness. The leather makes little difference, as long as it’s not nubuck or suede of course. You need something that can take boot polish, and you put loads on And that’s it, as anyone who’s used BGS or DMS boots will attest. The sole makes a huge difference. You want a rubber sole – the thicker, the better. I can recommend Suportlo leather from Degermann. Amongst others, Paraboot and Heschung both use it. Very strong and easily brushed up. Holds up well in Norwegian autumn/winter. Ages beautifully too. I previously have asked for your advice on finding a mens double breasted blazer-size 46/48-peak lapels in the US; you advised me try SUIT SUPPLY. I appreciated the advice. I live in the Mojave Desert where there is little rain, but I own a pair of Red Wing Iron Ranger shoes; item #8114. I think that they were created after previous shoes that I wore as a kid while working in a Great Northern Railway wrecking yard in 1949 between high school years. But don’t believe the company brochure about the shoes being applicable for working in a mine; it is not true. After high school, I was employed by the Anaconda Copper Co. in Butte, Montana as an underground miner. These shoes will not work in mine water, which was infused with copper sulfate and dilute sulfuric acid mine water.. I had to have rubber knee height boots with steel toes. but Red Wing Iron Ranger boots; item #8114 are high quality shoes for “kicking around” on weekends or for above ground work. If you are looking for some high quality leather goods, check out Lost Worlds Leathers. I have a horsehide motorcycle jacket, a mid length “suburban” and a waist length jacket. All are of very high quality, but be sure to check with the maker, as some of the jackets are cut to be “form fitting”. I particularly like them in the winter here in the desert, as leather is about the best garment as an outer layer against wind. Thanks again for the style comments on this site; I find the participants and their associated style comments interesting. Simon, what do you think of jodhpur boots? I am looking at EG’s Lambourn in dark brown utah… your thoughts would be much appreciated! Thanks! Agree on not wearing jodhpur boots with suits, but hat about with flannels and odd jackets? In general, would you go for the Galways (probably dark oak and mink suede) or the utah jodhpurs for versatility? Thanks so much. Thanks very much! Just out of curiosity, which Galway make up did you go for? FWIW I’ve recently been in a similar dilemma. I narrowed it down first because I was looking for an autumn winter boot. This, for me, meant anything other than a rubber sole would be madness. Second, they are for weekend general wear and only very occasional weekday work wear. So needed to be relatively rugged leather. Finally, I am lazy so I couldn’t be doing with too high a leg to lace up. A mid height boot at most. I tried the Red Wing Iron Ranger and found them a good fit. But perhaps a little too rugged. In the end I landed on the Cheaney Jarrow R in dark brown chromexel. And my word I couldn’t be happier, would recommend them to anyone. Can be buffed to a moderate smartness, but didn’t cost so much I worry about them too much. Cheaper than Crocketts (who I wear for smart shoes) after their recent price rises. And oh so comfortable. For me the best compromise of smartish and rugged I could find. Seconded. Joseph Cheaney make fabulous, comfortable shoes and like PW have found the correct equilibrium between their incredibly high quality and price. Much under celebrated in PS column inches ! Real McCoy’s is, of course, a Japanese brand available in London. Heschung do some nice split toe boots in grain which sit between edward green and red wing in terms of smartness. Simon, is there a particular brand which stands out for you? also, you seemed to like AIC denim, how do these measure up having worn Blackhorse Lane? I am am focussed on fit, high rise (not too high), a good taper and regular slim silhouette. any thoughts appreciated! A particular brand for which product type? I do like Anglo-Italian denim for the cut and style, but they should be seen as a different beast to most high-end denim makers like Blackhorse Lane, as they’re not raw, they’re all pre-washed. Not for those that really like they’re denim therefore. For boots, the Berluti Brunico is nice, admitedly on a different price band. I have a pair of chromexel Alden Indy boots that I picked up at Leffot in 2013. Since the chromexcel can hide scuffs and marks very well with some light buffing, I tended to keep them mint in the beginning, but over the years I’ve come to embrace the marks and they look all the better for it. I agree with your statements on pairings though. I’m actually wearing them today, paired with heavy cotton chinos, a heavy oxford shirt and a lambswool crewneck. Are those Armoury chinos pleated? 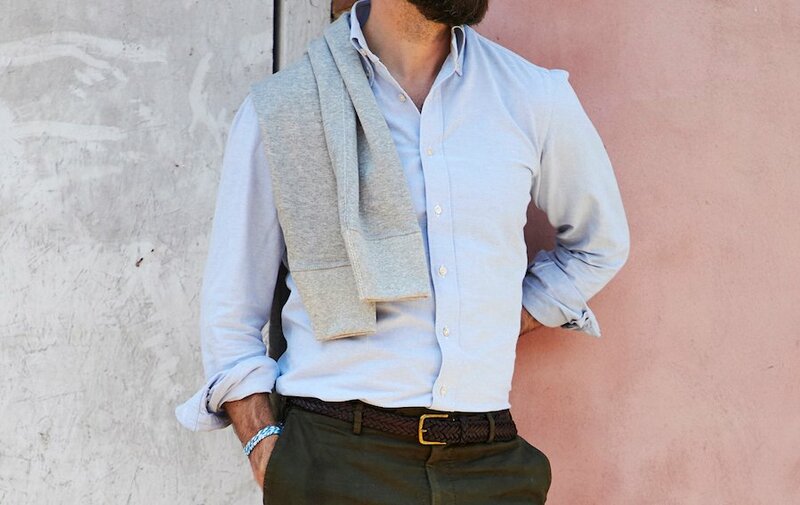 And how do you feel about pleated chinos in general? Are you avoiding pleats only because they open up? I’m having some 420g cotton trousers made with single pleats, don’t you think they add visual interest to trousers and ‘break up’ the front, especially when it is a rather large area? Yes, they certainly have that effect. I’m mostly avoiding them on more casual materials because it isn’t as fine and sharp as a suiting material, and therefore won’t stay as a sharp line. Thanks for mentioning workwear Simon. Personally I wear mostly workwear – Redwing boots, Quoddy boat shoes, Levi 501’s 1947 or 1966 raw denim, Real McCoys chinos, Real McCoys chambray shirts, Real McCoy sweatshirts in grey or navy, Real McCoys tshirts in white or navy, and so on. Expensive for sure but I find these pieces of clothing timeless, practical and relaxing to wear. I see that you wear mostly work wear; I am an old Yank, am retired and mostly wear work wear; Red Wing Iron Rangers, Wrangler Cowboy Cut jeans, Dickies 874 work pants (these are really inexpensive pants of high quality-can be gotten for $15.00) of any color.) I wear Lost Worlds leather jackets in the winter, as it goes down to about 20 degrees F in the winter. with wind. The reason that I originally went to this site, I am looking or a mens size 46/48 double breasted blazer-4-1/4″ to 4-1/2″ peak lapels and find this an impossible task in a world of skinny lapel suits and blazers. I must say that the people in this site are very style worthy, and the dress suits and blazers are not to be found in the US. Dressed up people in the US is a disgusting situation. Simon suggested I try Suit Supply, but it seems that they mainly specialize in smaller sizes, i.e. 38, 40, maybe 42, but that is about it. He is probably the best dressed person that I have ever seen pictures of, and his comments are most constructive. The tide of athleisure is calamitous, and she shall reach thy shores. 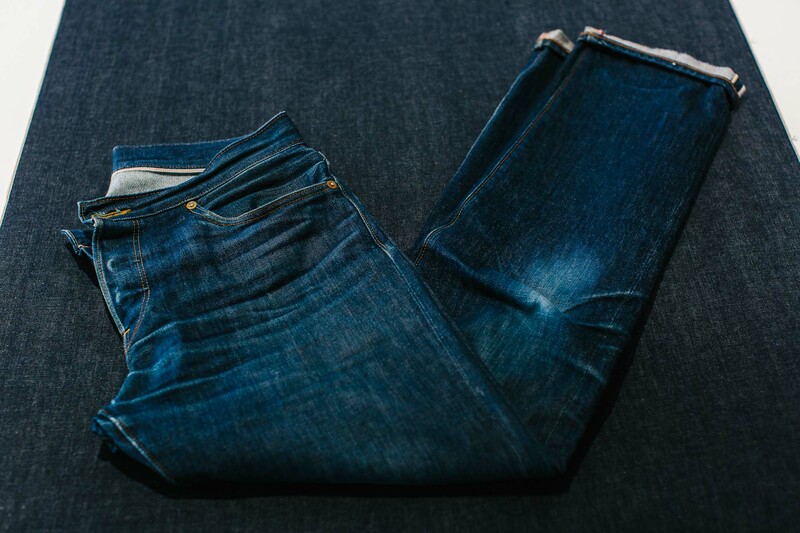 Did you ever try Full Count Japanese Denim? Super quality! First, thank you for all the work you do on PS ! I’m thinking about buying a green Field Jacket to be worn over a suit or on week-end. What kind of model would you go for ? A M-43 (with lapels) or a M-65 (with stand-up collar) ? I’ve seen that The Real Mc Coy’s produce high quality models. I like the M-65 personally. I find epaulettes a bit much. Have you seen the post with mine? Your jacket aged beautifully, Simon. I would recommend you to have a look at the M-51. It’s a mix between M-43 and M-65 with the best of both worlds. M-51 has no extension in the sleeves, lapels and no hidden hood in the back. The foldeable sleeves is a bit annoying and also the hood when folded in (builds up to a lump). But… Will you wear it through heavy weather? Go for a M-65. Real McCoy’s makes fantastic jackets. I wear mine often and I’ve also keept a really nice original M-51 jacket. Hi Christian, Thank you for this helpful advice I’ll check that. Simon, do you add any type of protectant/spray to your leather jacket as leather tends to stain easily? If so, can you recommend any? On the horsehide, no just a bit of mink oil occasionally. Re. boots, work style: Sorel, the cold weather specialists, have a new, more urban, line this year. Older standbys such as Loake, Cheaney’s (Trafalgar boot), Moncler, Paraboot, Grenson (Fred boot) are also worthy of consideration. For good value. smart and durable boots, R. M. Williams take a lot of beating. They age beautifully and last for ever. I have a pair of R M Williams boots I have had forever and they are great. I was thinking of getting another pair, however, I had heard that recent changes in ownership/management of the company had led to a decline in quality. Any insights? as an aussie, I have to agree. They are also very, very comfortable straight out of the box. Simon, I wanted to ask if you know how Allen Edmonds compares to Alden? Not really, no. Sorry. It’s not a brand I know a lot about and isn’t widely available here – and it’s not one I own either. Simon, fun article thanks for sharing, can you comment on the sweater you are wearing, color, material, brand, the ribbing on the sleeve seems to have a rugged look and feel. The one with the horsehide jacket? It’s a mid-grey shetland sweater from Anderson & Sheppard. The ribbing is pretty standard, but shetlands have that nice rugged texture – you wouldn’t want it against the skin, but nice over a shirt. Similar to the appeal of tweed in that way. Simon, thank you, yes the one with the horsehide jacket. Managed a trip to AS late this summer on vacation from NYC, picked up a few knitwear and flannel pieces, very well done by AS with great service. Thanks for the inspiration on that. Hi Simon! Great article! I have been looking for a leather jacket for a while but haven’t found anything fitting me properly yet. I am very tall and slim and everything I tried on is either too short or too wide… I love The Real McCoy’s (I tried few models in London) but unfortunately I’m facinh the same problem. Any suggestions? Should I try bespoke? If so, what would you recommend? I would go for it, but I’m afraid I might lose the “vintage” look which is what I like the most. Thanks! 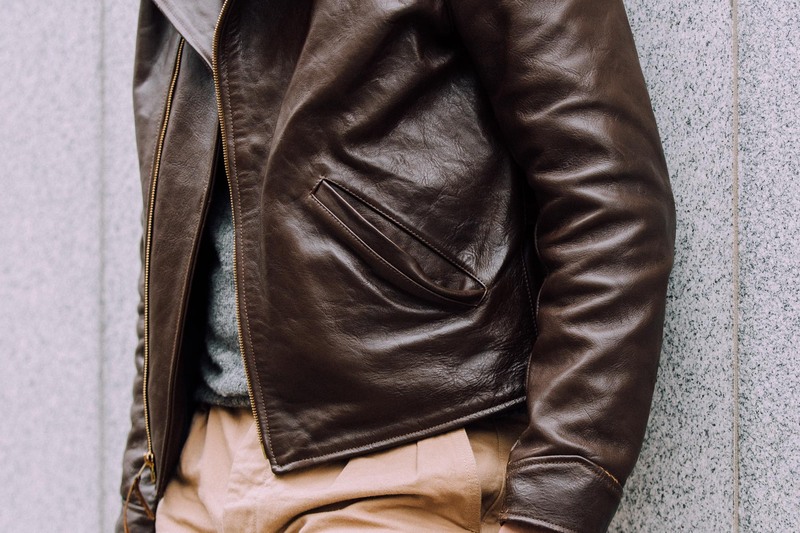 What type of leather jacket are you looking for? Which models did you try from Real McCoy’s? They have a lot of different fits and leathertypes depending. And one thing is for sure, the leather will crease and you will loose lenght in your arms, in my experience about an inch. Simons jacket is in FQHH (frontal quarter horse hide – great choice) from Shiki Hikaku Tannery (Japan, considered the best by many). This quality will adopt to your body over time and shrinkage may accur if you expose it to water – which you should. Wear it and tear it. It will last. My point is ; aim for a size that’s a bit roomy if your going for a horse hide quality. Trust me, i’ve tried it the hard way. You should also look up Himel Brothers (US) work. His work is amazing, with nice leather qualitys and you can make special orders. For less pricey alterntives we have; Diamond Dave (US), he can also make special orders. And of course Aero (UK) and Eastman Leather Clothing (UK). It’s possible to special order there as well. I can second your point about the Armoury’s Army Chinos. I bought a pair in January. They have a medium (to high? rise) that bespoke folks would appreciate, and the construction is so solid that the trousers feel like something from the past. The luxury is in the construction, and I really appreciate it every time I wear them. The wider leg is a great antidote to the “slimmer fit everything” that you see in RTW these days. Even though I bought the navy blue (the beige / tan were sold out), they’ve proved versatile and comfortable. They were the only item I could afford at Armoury prices, but I know that I’ll have them for a long time, and I won’t need another pair of navy chinos in this style for several years, and so they’re a great go-to. For someone living in the UK / Ireland, you could wear them all year round if the summer’s mild; summer might be stretch in the USA, but definitely three seasons. The cotton, although thick / indestructible, feels cool to the skin, which is nice. Simon- as a matter of interest where do you stand on Sunspel sweatshirts? I notice you have written about their briefs and t shirts, but you haven’t mentioned the sweats. Perhaps a little lightweight and no v. but pleasingly clean I thought. 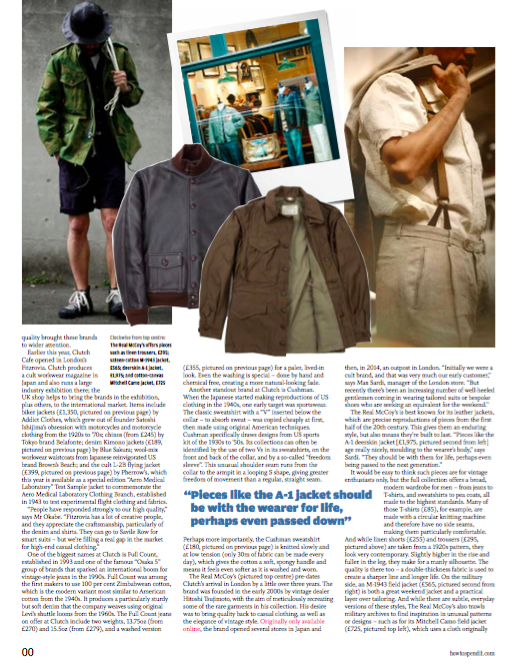 Nice article and I also think quality workwear is a nice addition to any wardrobe. My favourite pieces: Boots: VIBERG – Service Boot (CAN), ALDEN -Indy. Workwear Chinos: Studio D’Artisan (JPN), Tellason (USA), Left Field (USA). Jeans: Iron Heart (JPN), EDWIN (made in Japan-Line). Peacoat: Private White. Sweatshirts (Loopwheeler): Buzz Rickson (JPN), Real McCoy (JPN). Gloves: Red Wing, Hestra (Sweden). Sunglasses: Randolph (USA). About JOSEPH CHEANEY: I own an older Derby shoe and the Jacky Chukka boots and really like both of them, great quality and comfortable. ALLEN EDMONDS was also mentioned and I think it depends what line, they have different quality ranges. I own the Delray shoe and really like it as a casual summer shoe, the construction of Allen Edmonds is very comfortable. Their Higgins boot has a good reputation as a workwear style boot, but I do not own it, cannot comment. Simon, loved reading your article. It’s my first but won’t be my last. 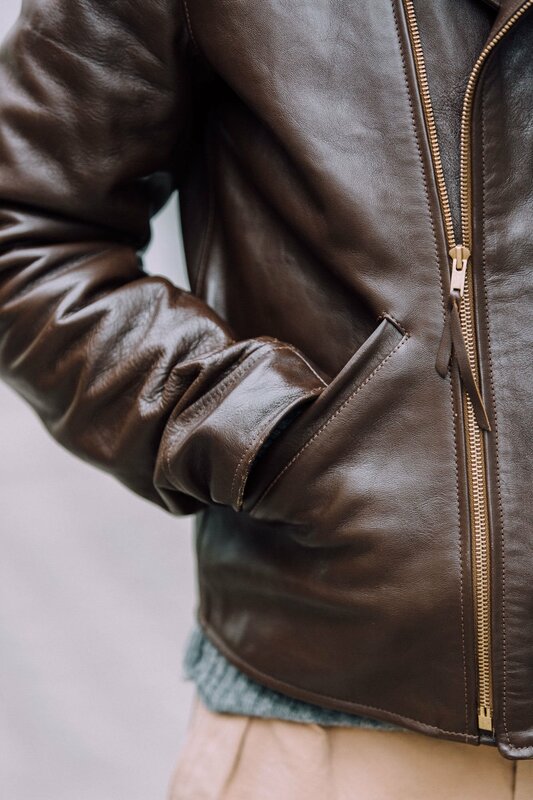 I’m sort of a leather and outerwear expert as I’ve designed it for over 30 years and after serving as the design director for the U.S. Army brand, I’m starting up a new brand that I find is clothing that I have trouble finding. (sort of why I started designing in the first place) It’s great to see someone like yourself writing about what I love with the same passion that I have. Just wondering, Simon, if the leather jacket the Armoury did with The Real McCoy’s was something you would have got if the former hadn’t been involved, or was it that the Armoury gave it a certain twist that appealed to you more than T.R. McCoy’s offerings? Another question – the Real McCoys are doing a vintage-inspired grey sweatshirt, all made via methods truer to the original garments from the ’60s, etc., and thus apparently longer-lasting and harder wearing. But at what point does 275 sterling, or thereabouts, for a sweatshirt become a little bit absurd? It’s a question I’m considering, as I might purchase one myself, as long as it lasts me 10 years or so. Hi Simon, I feel the same as you. And since there isn’t a brick and mortar Real McCoys in NYC where I could try one one, I’m very happy with the Todd Snyder / Champion grey sweatshirt collaboration that my wife got me for Christmas. It’s a great snug fit, very warm, and feels well made. It has the traditional grey sweatshirt look, and I’m very happy with it. I’m sure it’ll last a long time. Real McCoy’s is just something. This usually were I end up when it comes to estetics, quality and paying a contribute to the heritage of the garment – when it comes to re-producitions and work wear. I would recommend their sweatshirts. In my opinion, it’s worth the price I once paid ( 220 eur) and if I calculate cost-per-wear it’s definitely worth the price. I own a grey zipped sweatshirt, 12 oz. It’s very comfortable and I wear it regularly. I’ve got a pair of the Armoury’s “Army” chinos which are great. Brycelands also have “Army” chinos which are even higher waisted and wider in the leg (the material is similarly sturdy to the Armoury ones but a bit more refined). I’m tempted to get a pair but am concerned whether they’re a bit too exaggerated. I was wondering whether you’ve tried them and had any thoughts. I do own a pair (khaki). The fit is wide, with a very pleasing higher waist as you mention. The fit is spot in and they are very comfortable to wear. To exaggerated? Maybe. But not if you ask me. What size did you go with in the Armoury jacket, 38 or 40? I find I’m usually one size up from you and may give one of these a try. Thanks very much. Yes I would, though my first safari jacket would be a linen one, and my first suede jacket more of a bomber.